The Gill Corporation-France has two work cells that are dedicated to special processing of honeycomb core. In addition the industrial honeycomb group makes commercial-grade core from 3003 aluminum foil in thicknesses that range from 40 microns to 110 microns while the second line manufactures honeycomb for aeronautical and space applications from special 5052 and 5056 aluminum alloy foils ranging in thickness from 20 microns to 110 microns. The honeycomb core surface treatment applied by The Gill Corporation-France provides significant protection against corrosion and therefore can be used in the most demanding applications. The capability for producing this type of aluminum honeycomb is unique in Europe. The Gill Corporation-France uses state-of-the art technology to process and machine honeycomb, providing the tight tolerance parts demanded by our aerospace customers. 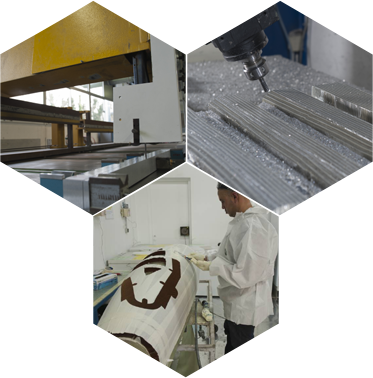 Furthermore, our 5-axis milling machines can produce exceptionally large precision parts, up to 6m x 3m x 1 m.
With its significant bonding expertise, The Gill Corporation-France manufactures sandwich panels for the industrial market using a complete range of structural core materials. These panels incorporate a variety of skins: aluminum, wood, carbon, glass prepregs and more. Our panels range from simple, basic shapes to extremely complex and technical parts. The Gill Corporation-France has developed unique expertise in using aluminum honeycomb as a kinetic energy shock absorber. We have applied this knowledge to help solve problems in aerospace, high-speed trains including the TGV, hazardous materials transportation, and automobile safety.